How small and basic…cruiser. – Dirty wet dog , boats and sailing. Note to regular readers, this post is a complete re-write of a very early post of mine in the blog when i was just starting to write about boats, their owners and voyages that captured my interest. Just recently i pasted a link to that old post into a relevant discussion thread on the Facebook sailing page but when i re-read my own post i realised what a messy and incomplete blogger i was in those days and how inadequate the post. Since then i have learnt a better discipline of writing fairly quickly but then editing and scheduling slowly so that i can edit and correct my own work and often adding a lot more flesh on the bare-bones post before it goes public. The original post was called “How small-…..ocean” and my intended theme was to discuss and highlight the possibilities and potential of small craft to complete very long and adventurous voyages. In that first post i based a lot of that idea around the boats and voyages of one British sailor : Roger Taylor and i used mainly other peoples material to fill out the post. I remember that at the time i actually had other sailors and other situations in mind other than the extreme end of what Roger does, even given the competency of what he does. There is only one Roger Taylor and what he does is way beyond what most of us would ever contemplate doing ourselves and today i think that it is less reasonable to hold up his sailing as an example of the possibilities of small boat sailing. If you will it is that in most sailors minds there would simply be too much disconnect between what the average, you and me then, do and what he does although let me add that i have enormous respect for what he does. In this post then i want to explore what i call ‘the art of the possible’ with small cruising boats and where the main theme is a kind of question along the lines of “just how small and basic a boat can we get away with” and secondly “what can we do with it” , i would like to begin with a short story of my own and this goes back to the time when i was writing the original post…..in fact it was the inspiration for that post. My own boat is a 22 foot Hunter Liberty weighing-in at just over a ton and a quarter, with her small sail area and low ultimate stability she can’t be classed as an ‘offshore’ boat, in fact by EU ‘regulations’ she should be regarded as an inshore/protected waters only craft….essentially a dinghy with a lid ! Of course i’m a British sailor and quite honestly say bollo*** to the Eu and it’s stifling regulations. Having got that out of the way this is a little tale of taking the same boat across the wide and scary English channel. Two years ago in early summer i was watching the weather pattern and trying to work out a plan for our early summer break. The combination of several days of consistent light northerlies and enough days in between work shifts had me seriously planning a cross-channel trip with the Liberty. Just to say that my base is well inland on the Tamar and i would need one tide just to get down to open sea and that from Plymouth sound to the breakwater at Roscoff is around 100 miles so it’s a decent passage for a small boat. 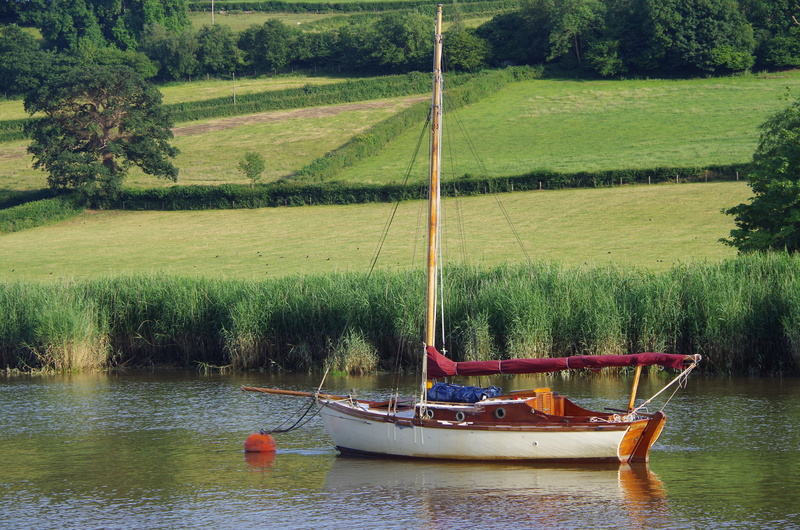 My plan was to catch the top of the tide at base (Calstock) and carry the ebb down to Plymouth sound, do some essential shopping in the city and then move over to the Kingsand/Cawsand anchorage for the afternoon and evening, get some sleep and then be in position for an early start the next morning. That jumping off point would also allow me to call off the trip south and just go either east or west along the coast if anything changed. There was so little wind in the Tamar that i motored all the way down through the Hamoaze and hit a thick sea-mist sitting over the sound and the city such that i had to ‘handrail’ my way around the main ship channel and get into the marina at the Barbican as being the nearest point to a decent chandlery and a supermarket. Now…..i will admit that both me and my boat are a bit on the scruffy side……WABI”’ often wears a muddy streak down one side from laying in the mud and her owner wears clothes that are mainly ‘distressed’, i am for example always immediately recognised abroad as a scruffy British sailor which i don’t mind at all. To say that the posh marina, and notably it’s berthing ‘manager’ weren’t particularly pleased to see me is a kind of understatement. His look of sheer distaste was almost comical and all he wanted to know was how long i intended to be taking up space on his visiting pontoon…..and not that there wasn’t plenty either and even though i could tuck WABI”’ into a space that he couldn’t get a ‘proper’ yacht into. Ahead of me was something generic French plastic, about 40 feet and pretty new by the look of it. Just abaft of me was a larger and very smartly turned out Dutch yacht with a very affable owner and we spent a little while discussing conditions in the sound before i made my excuses and headed off to do my shopping. When i got back to the marina about 2 hours later the Dutchman was just preparing to leave so i did the decent thing and helped him with his lines and a good shove to get his bow out. Just after that i noticed that the hatch was back on the new looking yacht ahead of me, that there were sailbags and shopping bags piled up next to her and the owners wife , i presume, was having a very loud conversation on her mobile phone while standing next to my boat and viewing it with what i can only describe as a ‘cats-arse’ expression of disgust. I of course smiled sweetly and carried on filling my water cans and getting ready to pull out. I couldn’t help but overhear the very loud phone conversation and it was all about how awful it had been on the motorway and how horrible it was that there was thick fog and that they couldn’t possibly leave the marina in such terrible conditions and were apparently bitterly disappointed that they wouldn’t be able to get to Fowey short handed. I think it was round about then that i took a closer look at them and the boat : them, about 30’s and wearing very smart and very new looking yachting branded clothing, the boat….40 feet with roller furling main and jib, bow thruster, radome and GPS aerials on the back plus what i thought might have been a satphone dome. Well…i started my noisy little outboard much to her annoyance , got my lines aboard and got out of there. It was still claggy under the Hoe but once again i handrailed around just outside the ship channel until i could dive into the anchorage just off Edgecombe but there was a lot of noise there with a band playing so i carefully worked my way up to the bridge buoys and around to Cawsand…..where i popped out into a clear and sunny afternoon and got my anchor down . As i remember it i made some lunch, did some navigation work, plotted some waypoints into my new (secondhand) handheld GPS and then got my head down for some sleep. My passage plan was to leave the anchorage at around 0600 but at 0200 i was wide awake so i made a drink and had a look outside. It was a clear cool night with excellent visibility and a light northerly wind so i just decided there and then to go at it. The routine for my boat is to hoist the mizzen first which keeps the little Liberty head to wind, then shorten up the anchor, then drop the board and rudder, hoist the main but keep it high with the lazy jacks and then pop the anchor. On the day i decided to bring the main anchor aft to the cockpit to lighten the bow. WABI”’ will sit like that hove-to until anything else is done and just making a slow stern-board. With the mizzen dumped out she then spins downwind as the wind on the main-mast takes over. Within seconds i have the lazy jacks cast off, the vang on and the boom well out. The Liberty excels at light weather downwind sailing so even with little breeze i was soon making my miles and the eastern sky was just lightening up. There was nothing else on the water apart from the lights of one ship making up channel. At that stage i knew i had somewhere around a 24 to 30 hour passage ahead of me with 2 shipping lanes to cross and would then have a night approach to a rocky coast that i don’t know well as a sailor. My day and night at sea would be all about sailing the boat as quickly as she would go, watchkeeping, getting across the 2 shipping lanes and keeping myself in good order. At this point i should mention that WABI”’ set-up at that time was very basic : i didn’t for example have a tillerpilot or even enough battery capacity to run one. My method of self steering would have to be some string, bungee cord and the best downwind balance i could achieve. That ultimately meant not having the mizzen up , having the board back a bit and going a bit slower. I should also detail my navigation equipment at that time. The boat came with a steering compass and i alreday had an excellent set of bino’s with a built-in bearing compass. I had a very basic handheld GPS which i was struggling to set up, charts for the UK south coast and some charts for Brittany. One of my main purchases had been a chart of the western portion of the channel. Aside from those things…..nothing really. The passage itself was unexciting, the sun came up and the wind came up a bit with it so i hand steered for a few hours with all sail to make some miles. At least every hour i checked our position and course although i knew my ground track would be a slow ‘S’ with the east-west ebb and flood. I crossed the 2 shipping lanes under full power for maximum speed and by evening was some 20 miles north of the French coast in very little wind with the sun going down. I decided on a night approach and dawn entry so that gave me some hanging around time, as i was well clear of the shipping lanes and the Roscoff ferry had already come past me in the distance i chose to heave-to in open water with the mizzen sheeted in and a lantern up . I went below, made a hot meal, checked my horizon a few times and then got my head down for a while . I don’t think that i slept, maybe had a doze for a while but felt a lot more clear and fresh again when i went back topside. In the dark i could clearly see the light on the Isle de Batz down to the south and i think the huge light ‘La Vierge’ down in the far west. I layered up, started the motor and motored south, steering an approximate bearing to the Batz lighthouse. A few hours later i passed the main harbour in Roscoff and put alongside a pontoon in the new marina there. All in all i was very tired when i got in and a bit ‘fuzzy’ but got a few hours sleep before the marina guy came and found me. He directed me to a berth and after a few hours more sleep i walked over to the ferry terminal , went aboard, had a shower and crashed out again. I don’t think of that passage as anything exceptional, it was just long and tiring with the tools available. Others might consider a solo cross-channel passage like that a rash, even foolhardy one and some would argue that the boat was nowhere near a capable boat or well enough equipped for an offshore passage. I disagree (of course) the conditions were settled and benign, i had fuel, water and food enough for at least 5 days at sea and at worst only about 30 hours to stay awake and sharp. The boat is sound and in my more recent experience as fast downwind in light weather as many much larger boats. My log keeping habit i have described before but for now i return briefly to my ‘second page’ which i keep opposite the usual log entry of courses , bearings and positions. In that i keep a running narrative about the passage and that includes a defects & omissions list. For that passage my only notes were that the boat had been difficult to make self-steer downwind and that the masthead light failed, which is why i hoisted a lantern when i hove-to, and that i would really have benefited from a tillerpilot. You can of course draw your own conclusions about my passage and the non-passage of the couple with the 40 footer (and all the gear). What i can say is that when we rejoined the boat after a ferry ride back across the channel a couple of weeks later we then cruised up the Morlaix estuary usually anchoring over the mud and routinely drying out….that were able to get into places that the all generic deep fin keeled boats just can’t go and i believe had a better experience of sailing just from that ability alone. Of course we lack the ultimate space and comfort of a 40 footer but i have to ask the question “do we need that……to go to sea” and clearly the answer is no. As i see boats get larger and their gear become more complex, and that is all industry and yachting press driven, i have to wonder whether more sailors would get more enjoyment and practical utility out of much smaller boats. I even wondered if was possible to downsize from the liberty and still get to do some good sailing and funnily enough that’s where this thread of posts really begins. Next How small….downsize and solo.